It’s a little late but hey better late then never. Bobbi Brown Sheer Powder Brush – I ordered this brush pack in December and I have used it everyday since. I love to use it for bronzer and blush. It picks up just the right amount of product. Armani Eyes to Kill Mascara – This is holy grail status for me. I can never be without this mascara. It gives my lashes such volume and I don’t need to curl my lashes either. There is no flaking and no transferring. I have never found another mascara that I love as much. Albeit Lip Balm – I use this lip balm every morning to prep my lips. It has a thicker texture then my fav Jack Black or Malin + Goetz ones. It really helps nourish my lips and get them ready for lipstick or gloss. Nars Satin Lip Pencil in Yu – I have wanted this shade for the longest and I was so happy to see it in the Nars Coffret. It is such a beautiful bright pink shade and has made my winter a bit better. Physicians Formula Argan Oil Blush in Natural – I saw this in Harmon’s one day and I could not resist. Isn’t it gorgeous !! There is also a darker shade but I opted for the lighter one and it looks great on my pale skin. What are your favorites at the moment ?? ps – how adorable is my new makeup pouch !!! If you are in NYC you can probably find them in Chelsea Market or you can visit her Etsy shop ! Thanks !!! 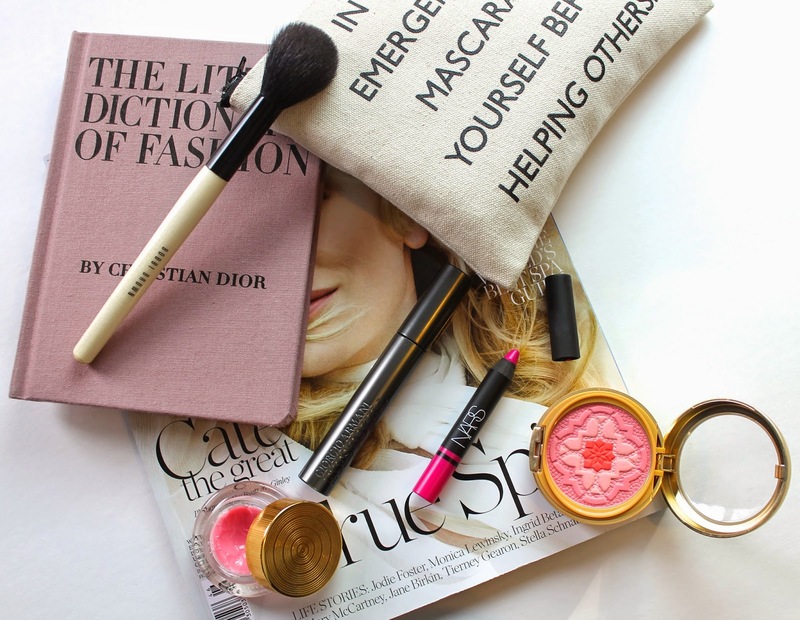 The PF blush is to die for !